China has long been a model for economic success. The neo-liberal myth wants the world economy to be stimulated by cheap labour. After having transferred labour to Asia only few workers have remained in the labour process in the Western countries. Competition in the labour market by migration and precarious labour contracts have reduced the number of strikes and their extent there. In China both developments do not stand in the way of fierce workers’ struggles, but even foster them. What are the consequences for China and the world when the economic negotiating space shrinks under pressure of the crisis ? 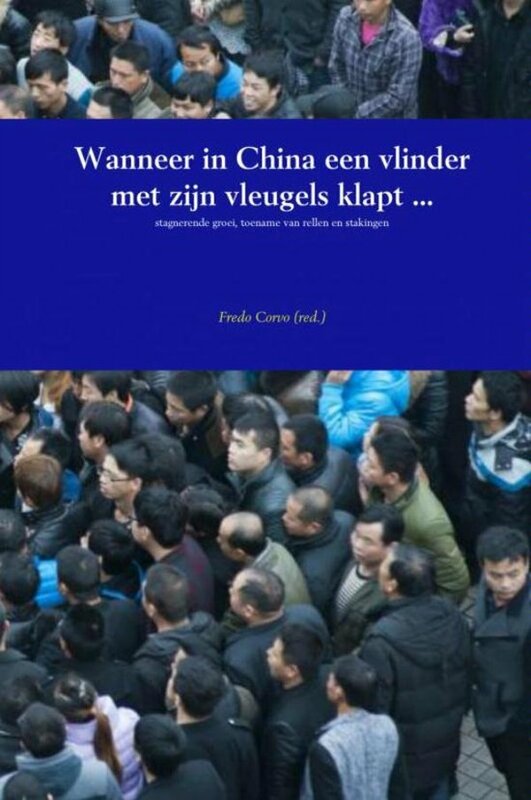 The Dutch language web edition Arbeidersstemmen (“Workers’ Voices”) has recently published a book with the title When in China a Butterfly Claps its Wings... Stagnating Growth, Increase of Riots and Strikes, presenting translations of articles by the Chinese group Chuǎng, of poems by the late Foxconn worker Xu Lizhi, and of some shorter articles from other groups. An extensive and annotated paper by the editor concludes this collection, advancing a critical appraisal of certain theses defended by Chuǎng. 6. “Instead of a Foreword”, A paper by Fredo Corvo. Chuǎng has announced this publication on its blog. In the following we publish the summary of the aforementioned paper by its author, and a brief presentation of Chuǎng and of Arbeidersstemmen respectively. Controversies, October 19, 2016. The full version of the paper can be viewed and downloaded at the end of the summary. As an explanation of the present chaotic markets the article presents the theory of crisis and imperialism by the Dutch council communist Anton Pannekoek. In this theory the concept of the industrial reserve army is essential to the imperialist need for the conquest of extra-capitalist areas in order to integrate more people into capitalism as wage slaves. Within this theoretical framework Pannekoek considered the Russian Revolution as a catalyst for movements of national ‘liberation’ overcoming Asian Despotism. In 1920 he was rather optimistic that the latter’s nationalist tendencies and its hostility towards the proletarian liberation movements could be overcome under influence of Bolshevism. After World War 2 Pannekoek predicted that capitalism’s main historical task would be ended when the masses of India and China would have been transformed into wage labourers. A rather unknown council communist critic of Lenin’s ‘The State and the revolution’ is brought forward against Chuǎng’s idea of a ‘socialist’ period in the history of the Chinese People’s Republic, declaring it should be considered as State Capitalist. Lenin actually adopted a reformist position, which falsely equals nationalisation of the means of production to socialism, a position already criticised by Engels and still refuted by Social-Democracy at the end of the 19th Century. Lenin’s identification of state capitalism with socialism fits into his distinction of two stages in the period of transition from capitalism to communism – a first, socialist, stage followed by a second, communist one. Lenin and Trotsky — in an analogy to the strategy of Marx and Engels in the European revolutions of 1848 — considered the Russian Revolution as a bourgeois revolution executed by the Russian proletariat that, with the help of proletarian revolutions in the rest of Europe, could be transformed into a communist revolution as part of the world revolution. While this analogy overlooked that capitalism already left behind its progressive phase, as shown by World War 1 and that, by consequence, bourgeois revolutions were no longer on the agenda of history, it may explain why the Bolsheviks adopted a reformist vision, identifying state capitalism with socialism. Lenin’s identification of state capitalism with socialism as the first phase of communism, was changed by Stalin into the idea of “socialism in one country”, thereby denying the necessity of world revolution. In World War 2 the idea of the proletariat executing this transition to ‘socialism’ was replaced by military conquest. China only escaped from the bankruptcies of other ‘socialist’ countries by an overt integration in the neo-liberal world order as ‘factory of the world’. With the stagnation of economic growth and increasing strikes and riots, after 100 years world capitalism starts tumbling for a second time by war and threatening workers’ struggles. While agreeing with Chuǎng’s self confident analyses of the struggles in China — the impact for the world proletariat of an eventual uprising of the proletariat in China is equalled with that of the Russian Revolutions of 1905 and 1917 — the paper brings forward some criticism of what it regards as modernist and academic tendencies in Chuǎng’s article “No Way Forward, No Way Back”. Starting from Marx and Engels’ 1845 historical analyses of the character of the proletariat, the paper opposes the limitation to an aspect of the proletariat’s ‘identity’, like that of ‘real subordination’, of ‘precariousness’, to just a fraction of the proletariat like its ‘new’ or ‘migrant’ part, or its unemployed or working part, and contradicts a conception that reduces proletarian consciousness as expressing ‘heterodox people’s traditions’. The conclusion warns against supposing a mechanical relationship between crisis and consciousness and puts forward the present need for groups of revolutionaries in the process of growing self consciousness of the working class. Postscript of : "When in China a Butterfly Claps its Wings..."
闯 Chuǎng: The image of a horse breaking through a gate. Meaning: To break free; To attack, charge; To break through, force one’s way in or out; To act impetuously. 闯关 (chuǎngguān): to run a blockade. 闯座 (chuǎngzuò): to attend a feast without being invited. Over the past three decades, China has transformed from an isolated state-planned economy into an integrated hub of capitalist production. Waves of new investment are reshaping and deepening China’s contradictions, creating billionaires like Ma Yun while the millions below — those who farm, cook, clean, and assemble his electronic infrastructure — struggle to escape fates of endless gruelling work. But as China’s wealthy feast ever more lavishly, the poor have begun to batter down the gates to the banquet hall. 闯 is the sudden movement when the gate is broken and the possibilities for a new world emerge beyond it. 闯 Chuǎng publishes a journal analysing the ongoing development of capitalism in China, its historical roots, and the revolts of those crushed beneath it. Chuǎng is also a blog chronicling these developments in shorter and more immediate form, and will publish translations, reports, and comments on Chinese news of interest to those who want to break beyond the bounds of the slaughterhouse called capitalism. To contact Chuǎng, send your e-mail to : chuangcn@riseup.net or visit its website : http://chuangcn.org/. More materials on China, as well as similar projects to Chuǎng’s, can be found on its resources page. ‘Arbeidersstemmen’ consists of a website and a blog with the aim of advancing the autonomous workers’ struggle, led by the following three basic positions: * for a humans world, void of war, terror, capital or state; * the workers don’t have a fatherland * all power to the workers’ councils More elaborate positions can be found in the ten theses on the coming revolution. In its web blog ‘Arbeidersstemmen’ informs about: * current workers’ struggles; * the social, economic and political context of the class struggle. The adoption of texts on the blog does not imply they fully agree with the points of departure of ‘Arbeidersstemmen’. If necessary this will be indicated in an introduction or a postscript. On the website theoretical and historical texts are published in order to advance the comprehension of current events. In its struggle to defend its living conditions, the working class changes itself from an exploited class in a revolutionary class that is capable of revolutionizing society. The corresponding development of proletarian consciousness manifests itself by a process of individual reflection and collective discussion, in which diverging and changing positions emerge. ‘Arbeidersstemmen’ has a role to play in departing from the historical positions of the proletarian internationalist current in the workers’ movement known in the Netherlands and Belgium as council communism. ‘Arbeidersstemmen’ is open for discussion with interested individuals with different points of view and who are looking for clarification with an open attitude. A partial cooperation with organisations sharing the three basic positions is possible as well. To contact ‘Arbeidersstemmen’, send your e-mail to : FredoCorvo@gmail.com or visit its website : http://arbeidersstemmen.nl.